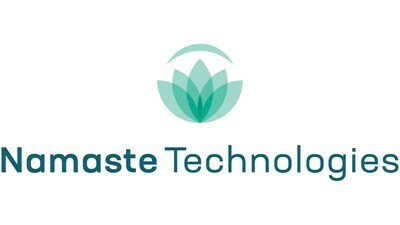 Namaste Technologies Inc. (“Namaste” or the “Company”) (TSXV: N) (FRANKFURT: M5BQ) (OTCMKTS: NXTTF) is pleased to announce that subject to the proposed legislation outlined by the Province of Ontario, that the Company intends to launch recreational cannabis dispensaries through its wholly-owned subsidiary, Cannmart Inc. (“Cannmart”) and through its partnership with 2624078 Ontario In. (“Infinite Labz”). Both facilities are located within approximately 5km from Pearson International Airport. With over 47 million passengers through the airport annually, Cannmart and Infinite Labz will provide travelers with a convenient location within minutes from the airport that will offer a variety of cannabis products sourced from multiple vendors. Cannmart is the first sales license which has been issued to a non-cultivator of cannabis in the Canadian market (the “sales-only” license). This allows Cannmart to offer a variety of cannabis products sourced from multiple license producers in a single platform. While the Company is focused on creating an online marketplace for medical cannabis, it has at the same time recognized the value of Cannmart and Infinite Labz locations and intends on launching physical dispensaries catered towards the recreational market. The Company has also secured agreements strong US brands like Lowell Herb Co. (“Lowell Smokes”) and Airo Brands Inc. (“Airo”) to produce pre-rolls and pre-filled vaporizer cartridges subject to regulatory compliance. These brands, which are already established will be produced and distributed by the Company through Infinite Labz and Cannmart in the Canadian market. Both Lowell Smokes and Airo brands products will be made available through the dispensary locations along with a variety of other cannabis products which will be offered through Cannmart and Infinite Labz.